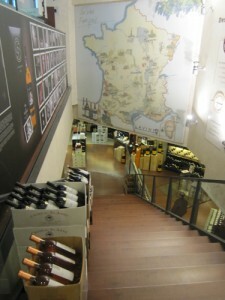 To buy a bottle of wine in Paris isn‘t rocket science but it can be a tough task for the demanding customer. Can you trust the charming “caviste” just around the corner? Are the chain stores any good? Are the supermarkets all bad? It‘s not that easy. In fact, there are many ways of buying your wine here, and you may find it surprising that the supermarkets can be the right choice: It was they, the big players like Carrefour or Intermarché or Auchan, who invented the concept of the “foires aux vins”, organising huge national wine “fairs” in order to create a new shopping event and to polish their image and overall “Frenchness”. They sent their scouts out to the provinces to buy decent wines everywhere and in great quantities – which brought down prices and made even rare and precious bottles more accessible to a wider public. 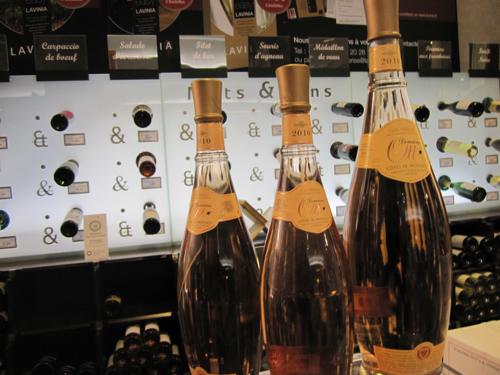 Don‘t be surprised to find Grand Cru wines and famous Château names on Parisian supermarket shelves. It‘s not a trick, it‘s capitalism. Still, you don‘t like the idea of carrying around a bottle of Château d‘Yquem in a mundane supermarket plastic bag? Need some ambiance while shopping? Paris won‘t let you down. 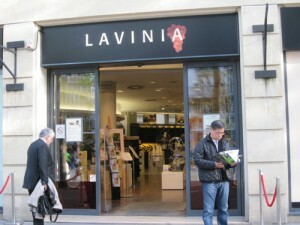 Try „Lavinia“ while here, basically an online chain but with two grand flagship stores on Boulevard de la Madeleine and out at La Défense, well-stocked stores selling the cheapest and the most expensive fare under one roof (the branch at Madeleine is quite spectacular). “Le Repaire de Bacchus” is a smart-looking chain with 31 branches on Ile-de-France and two dozen or so shops scattered all over Paris (a bit over-priced as a rule). “Nicolas” is an old bull running almost 500 shops all over France and one at every other corner in Paris. Both, the “Repaire” (cosier) and “Nicolas” (sort of industrial), are good stops when you‘re in a hurry or when you‘re not looking for anything too special. They are what I would call the basic “cavistes”. Your third option besides the supermarkets and the specialist chains is to trust the sympathetic, young wine merchant just around the corner who greets you every morning while constantly telling you that he’s in fact travelling all the time in order to find the really nice bottles only for you, cheap yet great – and that’s not necessarily a lie. But beware! The problem is that you won‘t find out, as a tourist, whether he‘s trustworthy or not. You see, shopping in Paris is all about intel in the end, as military guys would put it, you need reliable information to really find a correct and passionate wine dealer – and then it can well happen that you find a stunning, delicate, memorable bottle from a region you might have never heard of – for 8 or 9 Euros. Try your luck! There‘s a fourth, a fifth and sixth path to find a good wine but they‘re not really open to the ordinary visitor. I‘m talking about “vente privée”, full-blown auctions and the “salon du vin. Path number 4, vente privée leads to hidden doors blocked with secret entry codes, you‘ll receive confidential emails, if you make it into the circle – and at some point you‘ll be invited to exclusive sales events. I had the pleasure of attending some of them and they‘re always great fun (like the wines they sell, you know, amazing “terroir” stuff, real, rough wine). Path number 5 needs planning well ahead of time. And then, who knows? You might find yourself sitting in the amazing auction house Drouot, bidding for a chest of 1970’s Hermitage La Chapelle, sold by a closed down restaurant or a crazy millionaire who sells his belongings. Anyway, whichever way you choose, it should, in Paris, lead to a good glass of French wine. Don‘t try to find a good selection of Australian Chardonnay here or a choice of Californian reds. And why would you? France is God‘s own country when it comes to wine and cheese and lots of other things. No need to import anything. The domestic fare is always supposed to be superior, and rightfully so.